Once she said ‘Hypocrisy, thy name is BJP’ and now Shazia Ilmi is a part of BJP and so has joined probable and posing CM candidate for BJP, Kiran Bedi. 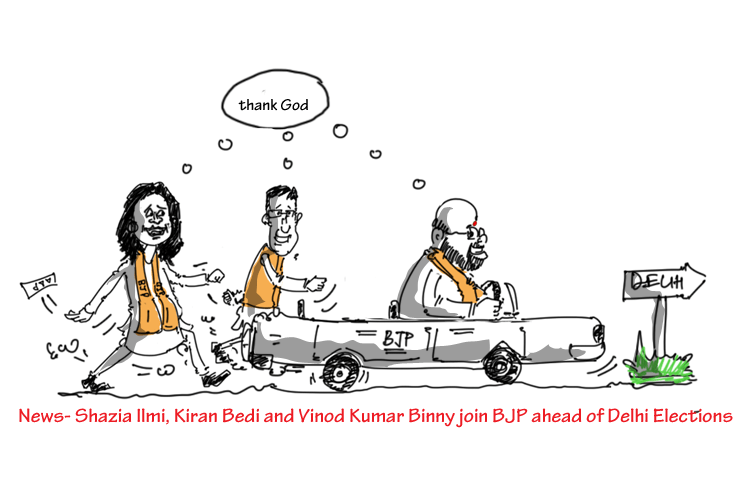 Followed them, Vinod Kumar Binny, former AAP top leader. Without a second doubt, the strategic self-promotion of Narendra Modi since 4 years in advance not only got him the Top Seat of the nation in 2014 with PM before his last name but also changed the decades old politics of ‘coalition Central Govts’in India and for good. The rightly hyped NaMo wave has put a serious threat to regional parties even in state level elections. Complete white-washing of MNS in Maharshtra elections is a fresh example of the changing mentalities of voters in India post NaMo wave. BJP on the ride of Modi wave has managed to penetrate big time in states where it was close to non-existent and has either managed to be a part of the state govts, wholly or in coalitions, or has instigated a seriously fractured mandate, like in cases of Jammu & Kashmir and Delhi in 2013. With BJP becoming more and more powerful and well placed in politics, politics itself remains unchanged. Politics is pleasantly hopping to the powerful in the desperate thirst of more power. They who once stood tall against the NaMo wave are helping the wave retain its slowly fading strength. So far politics has shown its character. It has not changed itself even though the govt at the centre changed. It has remained a hypocrite as it is known to be. Some Instances of recent Hypocrite behaviour of Politics. The BJP bagged votes for ‘Development of the nation and people’. There was close to no-talk on the agenda of ‘Hindutva’. Today, BJP ministers make headlines talking pro-hindu and the govt mostly and ideally prefers acting unaware. Politics has to please all- those who understand ‘development’ and those who understand ‘development of hindutva’. Black Money which played a major catalyst of white-washing Congress and its allies in 2014 elections and which was awaiting its flight back to India, as promised by the BJP and PM Modi, has again lost all its hopes to see its motherland, anytime soon. The anti-corruption movement started in 2011 fell prey to politics and the movement and its first face- Anna Hazare are long forgotten. Who made it big was politics by the name of Arvind Kejriwal, Manish Sisodia, Shazia Ilmi, Kumar Vishwas, General VK Singh, Kiran Bedi and a few more. Politics desires power more and more and has no friends and foes. The Lalus and the Nitishs who fought against each other joined hands when they both lost power. Politics promises to get to power and when it gets it, abruptly runs away for more powers. They walk together, walk alone and when required walk against each other. Make and break friendships and alliances. They blame each other, frame each other on corruption, mismanagement and what not and when necessary they hug one another as long lost friends. May be, BJP is no more ‘Hypocrite’or has Shazia Ilmi turned a ‘hypocrite’ now, as stated in one of her tweets in November 2013. Kiran Bedi who repeatedly questioned PM Modi’s role in 2002 Gujarat riots, till some times back, speaks highly of his leadership, today. Strange! Politics thy name is double-standards, desperate hunger for ultimate power, falsifying promises. Politics you promise to empower us but solely aim power to self. Hypocrisy, thy name is…Politics!! See more than these guys joining BJP what surprises me is BJP which is a cadre based party with a such a strong pipeline of leaders is bypassing talent within or this signifies there is no second line of leadership ready to take over and win votes ? But who am I to know ? its strange and yet not strange as its all about striving, getting , retaining and growing powers !! This speech by Cassius in Julius Caesar, explains what BJP has to say for the likes of Ilmi, Bedi et al. They are all Brutuses, BJP is Cassius and the people of India are Caesar. But the result can’t be judged from history or it can be. We, the Caesars are aware of who Brutus is and what Cassius wants but still we let them take control as we become blind in Trust or Mistrust.